Another housing inquiry probably has no idea just how much the property investment game has changed in the past 3 years. Now, jump investors are the ones to watch. Housing Affordability – that old chestnut. Everyone loves to complain about it. No one wants to do anything about it. And if you’re a politician, what’s the best way to do nothing about something? Have an inquiry. And so the latest inquiry into housing in Australia has just come to a close. And what was the Home Ownership Inquiry about? No one really knows. The terms of reference were pretty vague. Was it about affordability? Or ownership rates? Or negative gearing? Or planning policies? It was just kind of about everything. Houses and stuff. It certainly wasn’t the ‘Housing Affordability Inquiry’. Oh no. You can’t frame an inquiry that way. If you have an inquiry into housing affordability, then you’re saying housing affordability is a problem. And you don’t want to do that. Oh no. Cause if you let people think that affordability’s a problem, then they might have a reasonable expectation that you might do something about it. You want to manage those expectations very carefully. No government wants to be railroaded in to doing stuff if they can avoid it. And so we had a ‘Housing Ownership Inquiry’. So, it home ownership a problem? Some people would tell you that it is. Some people would point to falling home ownership rates as proof that the system is broken. Home-ownership rates have fallen from about 70% to 60% over the past 20 years or so. Sounds bad right? Fewer Aussies are owning their own homes. We should have an inquiry. But it’s not that clear. Because the flip side of home-ownership is home-investorship. And if ownership rates have fallen, that means investorship rates have risen. More and more Aussies are becoming property investors. Well, it could be if all the investment properties were owned by a handful of property tycoons. Exploiting a poor underclass of chimney sweeps. But that’s not what’s happening. More and more regular Aussies are finding that property is an excellent asset if you want to take charge of your financial future. And over the last 20 or 30 years we’ve seen a ‘democratisation’ of property investing. It used to only be a game for the rich elite. Now anyone can do it. And I really mean anyone. I’ve seen people come through my courses who never thought they’d ever get their heads above water. And now they’re fully in control. So if you’re telling me the rise of mum and dad investors is a bad thing, I’m not buying it. And I’m not buying that we need a ‘Home Investorship Inquiry’. But I’m not worried. The government appears determined to do nothing. Housing is squarely in the too hard basket. Has been for years. And I wonder if Australia has caught up to the reality of the jump investor. Jump investors are young buyers who have taken a different path into the property market. They’ve jumped the principal place of residence and gone straight to the investment property. And the data shows that jump investors are on the rise. Not the official data. They’re still stuck in the old paradigm. In the statisticians eyes, people only buy investment properties after they’ve bought a PPR. But the survey data shows that jump investors are a rising force. And for this we’ve had to rely on the tidy work of Digital Finance Analytics. It shows the new emergence of jump investors in yellow. 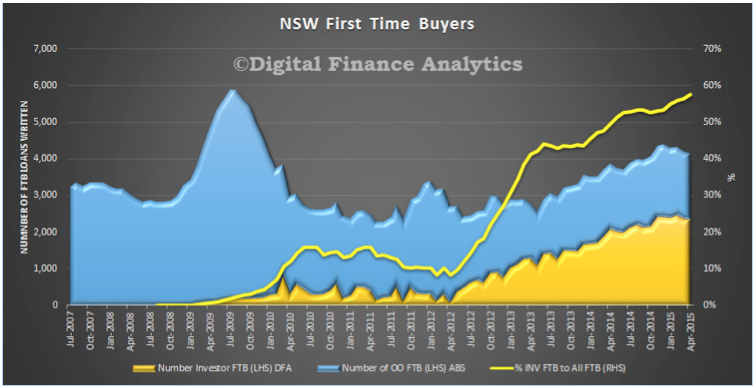 And what it shows is that about a third of first time buyers are investors, not owner-occupiers. 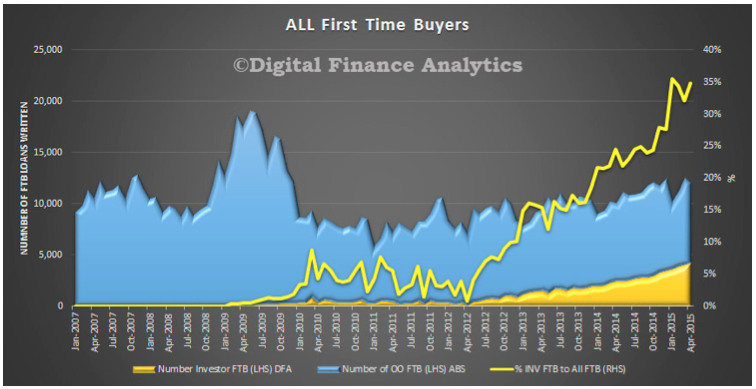 And when you include jump investors, suddenly the downward trend in first time buying (which has got everyone’s knickers in a knot) disappears. There’s actually a modest upward trend. And the trend is most clear in Sydney – our most ‘unaffordable’ market. There jump investors became a force to be reckoned with in 2013. Now, more than half of all first time buyers are investors. And first time buying is actually increasing strongly. DFA reckons the logic of jump investors is clear – it’s a lifestyle choice. They see property values appreciating in most states, yet cannot afford to buy a property for owner occupation in a place where they would want to live. So they choose the investment route. This enables them to purchase a cheaper property elsewhere by grabbing an investment loan, often interest only and serviced by the rental income. In addition they get the benefits of negative gearing and potential capital appreciation. Meantime they live in rented accommodation, or with families or friends. About ten percent of recent purchasers have received some help from “The Bank of Mum and Dad“. Finally, some see the investment route as a means to build capital for the purchase of an owner occupied property later, though others are now thinking more in terms of building an investment property portfolio. They are on the property escalator, with the expectation that prices will continue to rise. What do you think? Would you recommend jump-investing to your kids?